Owing to our rich industry experience, we are manufacturing, supplying, trading and exporting Terminal Insulators 100 Amps. Our experts manufacture these products at our multifaceted manufacturing unit employing latest machines and advanced technology. High grade material to be used in the manufacturing process is sourced by our procuring agents from reliable vendors of market. These products are available in variegated sizes and dimensions at most competitive rates. Our organization manufactures, supplies, trades and exports a wide array of Terminal Board Insulators 100 Amps. Our offered range is manufactured using premium quality material that is procured from certified vendors of the market. Available in various specifications and in compliance with international quality norms, these components are highly demanded in automobile industry. Furthermore, we timely deliver these products at clients' destination with the help of our wide distribution network. 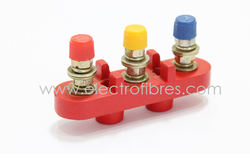 Backed by rich industry experience, we are manufacturing, supplying, trading and exporting DMC Board Insulators. These products are precisely manufactured using finest quality material following standards and norms of the industry. Our experts procure the material to be used in the manufacturing process from renowned vendors of market. Prior to dispatch, these products are stringently inspected on certain parameters of quality to ensure their zero-defect. Our company specializes in manufacturing, supplying, trading and exporting Terminal Boards. The range made available by us is manufactured using finest quality material under the close supervision of highly experienced professionals. These experts make sure to use optimum grade material in the manufacturing process. In order to cater to the varied demands of customers, we offer these products in a spectrum of specifications. Looking for Terminal Board Insulators ?